DIE Mercurii, 8 die Junii. Militia readily put in Execution in Es. Thanks to be given to the Lord Lieutenant and the County. about Letters from the Lord Willoughby at Lincoln. Letter from Lords at York. Subject of the Conference about L. Willoughby. Lieutenant of The Tower concerning the Arms that came from Hull. Sheriff of Lincoln to apprehend the Earl of Lindsey. Lieutenant of The Tower's Petition for an Allowance for Prisoners. Safety of The Tower to be considered. Declaration to be printed with the Earl of Warwick's Letter. Message to the H. C. about it. Earl of Warwick's Letter to his Brother, about the Essex Militia. Essex Militia and Voluntiers Petition to E. of Warwick. Order for disposing of the Arms from Hull. Gentleman Usher's Expences in sending for Delinquents. Lownes sent for, for reprinting a Petition from Yorshire. Message from the H. C. for a Conference about the Safety of the Kingdom. Subject of the Conference requested by the Lords. 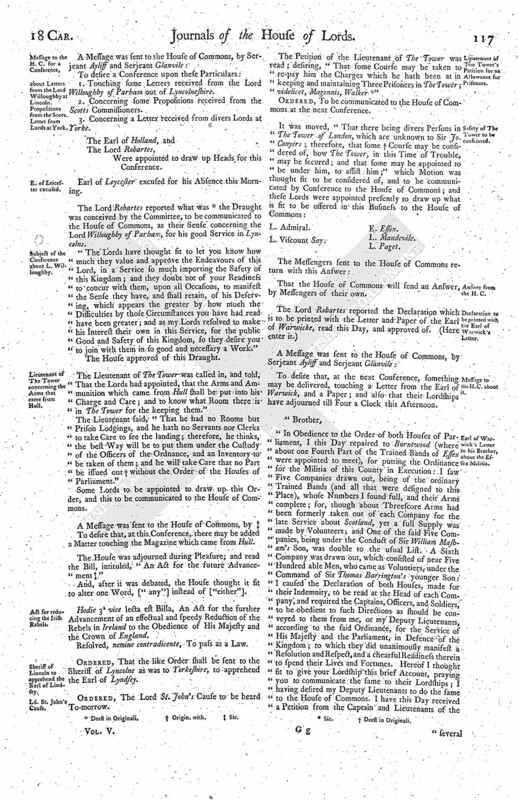 Declaration concerning the Essex Declaration. The Sense of this House concerning the Letter sent from the Nine Lords at York. Order for 662 l. 1s. 4d. to be paid to Mr. Loftus for Ireland. Order for Ordnance for Munster. Order for 10000 l. to be paid to Mr. Loftus. The Lord Wharton was appointed Speaker this Day by the House. A Letter was read, from the Earl of Warwicke, written to the (fn. 1) Speaker, concerning the ready Execution of the Ordinance of the Militia in the County of Essex. Ordered, That the Speaker shall give Thanks to the Earl of Warwicke, and the Earl of Warwicke to give Thanks to the Country; and a Declaration be made of their Lordships Acceptance. 1. Touching some Letters received from the Lord Willoughby of Parham out of Lyncolneshire. 2. Concerning some Propositions received from the Scotts Commissioners. 3. Concerning a Letter received from divers Lords at Yorke. Were appointed to draw up Heads for this Conference. Earl of Leycester excused for his Absence this Morning. The Lord Robartes reported what was (fn. 2) the Draught was conceived by the Committee, to be communicated to the House of Commons, as their Sense concerning the Lord Willoughby of Parham, for his good Service in Lyncolns. "The Lords have thought fit to let you know how much they value and approve the Endeavours of this Lord, in a Service so much importing the Safety of this Kingdom; and they doubt not of your Readiness to concur with them, upon all Occasions, to manifest the Sense they have, and shall retain, of his Deserving, which appears the greater by how much the Difficulties by those Circumstances you have had read have been greater; and as my Lords resolved to make his Interest their own in this Service, for the public Good and Safety of this Kingdom, so they desire you to join with them in so good and necessary a Work." The House approved of this Draught. The Lieutenant of The Tower was called in, and told, "That the Lords had appointed, that the Arms and Ammunition which came from Hull shall be put into his Charge and Care; and to know what Room there is in The Tower for the keeping them." The Lieutenant said, "That he had no Rooms but Prison Lodgings, and he hath no Servants nor Clerks to take Care to see the landing; therefore, he thinks, the best Way will be to put them under the Custody of the Officers of the Ordnance, and an Inventory to be taken of them; and he will take Care that no Part be issued out (fn. 3) without the Order of the Houses of Parliament." Some Lords to be appointed to draw up this Order, and this to be communicated to the House of Commons. To desire that, at this Conference, there may be added a Matter touching the Magazine which came from Hull. The House was adjourned during Pleasure; and read the Bill, intituled, "An Act for the future Advancement (fn. 4) "
And, after it was debated, the House thought it fit to alter one Word, ["any"] instead of ["either"]. Hodie 3a vice lecta est Billa, An Act for the further Advancement of an effectual and speedy Reduction of the Rebels in Ireland to the Obedience of His Majesty and the Crown of England. Resolved, nemine contradicente, To pass as a Law. Ordered, That the like Order shall be sent to the Sheriff of Lyncolne as was to Yorkeshire, to apprehend the Earl of Lyndsey. Ordered, The Lord St. John's Cause to be heard To-morrow. The Petition of the Lieutenant of The Tower was read; desiring, "That some Course may be taken to re-pay him the Charges which he hath been at in keeping and maintaining Three Prisoners in The Tower; videlicet, Magennis, Walker (fn. 5) "
Ordered, To be communicated to the House of Commons at the next Conference. L. Viscount Say. E. Essex. That the House of Commons will send an Answer, by Messengers of their own. To desire that, at the next Conference, something may be delivered, touching a Letter from the Earl of Warwick, and a Paper; and also that their Lordships have adjourned till Four a Clock this Afternoon. Burntwood, the 7th of June, 1642. "To the Right Honourable Robert Earl of Warwicke, Lord Lieutenant of the County of Essex, and to the Right Worshipful and Worthy Gentlemen the Deputy Lieutenants of the same County, consided in by the most Honourable the High Court of Parliament. "We the Captains and Lieutenants, with the full Consent of the Trained Bands and Voluntiers of the said County now assembled, having, before the Access of this present Parliament, seen our Religion, our Laws, our Liberties, and Estates, brought to the Brink of Ruin and Subversion, by the Results of most desperate and wicked Counsels, could not but with exceeding Joy behold the Assembling and Continuance of so Great and Faithful a Council (the Representative Body of this Kingdom), and with most certain Confidence there to all that was dear unto us. "And having also seen the late hellish Designs and Actings of a Malignant Party of this Kingdom, and the bloody Rebellion in Ireland, all working to retard the Progress, or subvert the Being, of this Worthy Parliament, and therein to bereave us of all our Hopes of Reformation or future Peace and Happiness to this Church or Kingdom; We cannot but ascribe all Glory and Praise unto the Lord of Lords, and express most hearty Thankfulness unto His blessed Instruments, that Great Assembly, for their undaunted Resolutions, unparalleled Endeavours, and happy Proceedings, for the common Good; and herein (as not the least Means to Safety) for the most necessary and seasonable Ordinance of theirs touching the Ordering of the Militia, whereby we are put under the Command and Guidance of so Noble a Lord and such Worthy Gentlemen; whereunto we humbly desire this present Day and Meeting may be an Evidence and Pledge of our free and willing Obedience. "And having intrusted our Religion, our Laws, and all, into the Hands of that Great and most Faithful Council the Parliament, whose Care and Fidelity we have so abundantly found; we even bleed to see the Heart and Actions of our Royal King (contrary to His own Royal Expressions) declining from the Counsels of His Parliament, and carried after other Counsels, whom as the Laws and Constitutions of this Land have not known nor reposed upon, so we (for our own Parts) neither will nor dare intrust with our Religion or Laws; and whom we verily believe, could (fn. 7) they prevail against that Highest Court (under God, our chiefest Bulwark and Defence), would soon deprive us both of Religion and Law, and (notwithstanding all their specious Pretences) reduce us to a Condition no less miserable than slavish. "From the deep Apprehensions of all which, we do freely and heartily promise and tender our Persons and Estates, to assist and defend (to the uttermost) the High Court of Parliament now assembled, the Members, Power, and Privileges thereof, and therein His Majesty's Person and Authority, and the Kingdom's Peace (according to our late Protestation), against all contrary Counsels, Power, and Force of Arms what soever, which shall be reared up or attempted against them. "And this our humble Acknowledgement and Resolution, which we doubt not will be accorded unto by all good Subjects, we humbly desire your Honour and Worships to tender, on our Behalf, unto that most Honourable Assembly of Parliament; for whose happy Progress and Success we shall ever pray. "To the Right Honourable the Lords now assembled in the House of Peers in Parliament. "The humble Suit of the said Lieutenant is, That your Lordships will be pleased to ordain each of them a competent Allowance, such as your Lordships shall think fitting for them, and to direct the said Lieutenant where to receive it; and he, as in Duty he is bound, shall pray for your Lordships prosperous Proceedings. "Ordered, by the Lords and Commons now assembled in Parliament, That the Remainder of the Arms and Ammunition which came from Hull, that shall not be thought fit to be employed for the Service of Ireland, shall be carried into The Tower of London, and there placed and stored by the Officers of the Ordnance, who are to receive the same by Inventory: And it is further Ordered, That Sir John Conyers, Lieutenant of The Tower of London, shall have a Duplicate of the said Inventory, and shall take Care that none of the said Arms nor Ammunition shall be carried out of The Tower, without the King's Pleasure signified by both Houses of Parliament. It was moved, "To have a Conference with the House of Commons, concerning the great extraordinary Expences the Gentleman Usher of this House is at, in sending for Delinquents and others; and to desire them to consider how he may be re-paid." Lord Wharton appointed Speaker by the House. Ordered, That Ric. Lownes shall appear before this House To-morrow Morning, for re-printing a Petition, intituled, To the Right Honourable the Lords and Commons in Parliament assembled, The humble Petition of the Gentry, Ministers, Freeholders, and other substantial Inhabitants, of the County of Yorke. 2. To let their Lordships know, that the House of Commons will give a Conference, in the Painted Chamber, presently, as is desired. These Three Orders the Lords approved of. To desire a present Conference, about some Propositions concerning the Safety of the Kingdom. "1. To acquaint the House of Commons with the Lord Willoughbie's Letter, and the King's Letter to him, and his Answer thereunto. "2. To deliver to the House of Commons the Sense of this House concerning the same. "3. To acquaint the House of Commons with the Two Propositions which came from the Scotts Commissioners. "4. To communicate to them the Letter of the Earl of Essex, and the Declaration of that County, and a Declaration of this House to be printed with the same, and desire their Concurrence therein. "5. To desire them to join in an Order, touching the delivering the Magazine that came from Hull, to the Officers of the Ordnance. "6. To communicate the Letter of the Nine Lords at Yorke, with the Sense of this House thereupon." 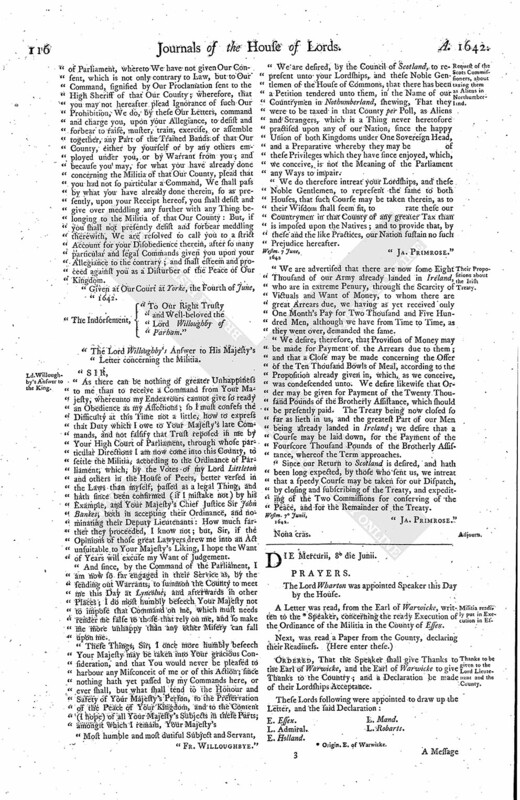 "The Lords and Commons in Parliament assembled, being advertised, by the Lord Lieutenant and Deputy Lieutenants of the County of Essex, of their ready, full, and forward Meeting of the Trained Bands of that County, and of a chearful Access of a very considerable Number of Voluntiers at their first appearing, have thought fit to express unto them the good Sense they hold of their Proceedings, so much conducing to the general Safety of this Kingdom; and having likewise received from them a Declaration, full of Affections and good Inclinations to maintain our Religion, Laws, Liberties, and Privileges of Parliament, which they observe to be invaded by pernicious Counsel (as indeed they have been of late in a more dangerous and high Manner than any Age can parallel); and having very prudently observed, in a right Understanding, that the Kingdoms, and the King's Authority and Person, can be no ways maintained, but by the upholding the Power and the Privileges of Parliament, as by the late Protestation (fn. 9) they acknowledge themselves bound unto, against all contrary Counsels, Power, and Force of Arms whatsoever: This just and faithful Resolution of theirs to the Public Good, the Lords and Commons do not only approve, but commend; assuring them, that, as all their Endeavours have been for the Peace and Happiness of the King and Kingdom, so they will persist, in Discharge of the great and public Trust which lies upon them, to go through all Difficulties which may oppose the public Peace and Welfare of this Kingdom, and will, upon all Occasions, be ready to express particularly to those Persons that Respect which is due to Persons from whom they have received such Assurance of their Affections and Fidelities." 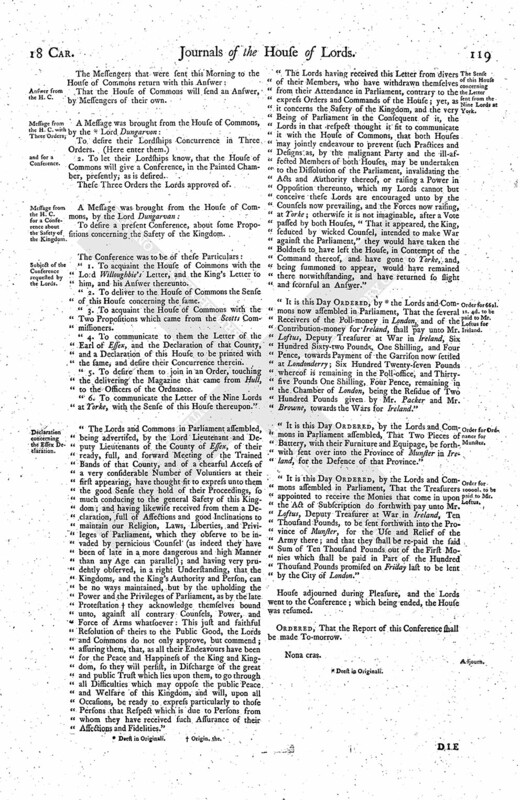 "The Lords having received this Letter from divers of their Members, who have withdrawn themselves from their Attendance in Parliament, contrary to the express Orders and Commands of the House; yet, as it concerns the Safety of the Kingdom, and the very Being of Parliament in the Consequent of it, the Lords in that respect thought it fit to communicate it with the House of Commons, that both Houses may jointly endeavour to prevent such Practices and Designs as, by the malignant Party and the ill-affected Members of both Houses, may be undertaken to the Dissolution of the Parliament, invalidating the Acts and Authority thereof, or raising a Power in Opposition thereunto, which my Lords cannot but conceive these Lords are encouraged unto by the Counsels now prevailing, and the Forces now raising, at Yorke; otherwise it is not imaginable, after a Vote passed by both Houses, "That it appeared, the King, seduced by wicked Counsel, intended to make War against the Parliament," they would have taken the Boldness to have left the House, in Contempt of the Command thereof, and have gone to Yorke, and, being summoned to appear, would have remained there notwithstanding, and have returned so slight and scornful an Answer." "It is this Day Ordered, by (fn. 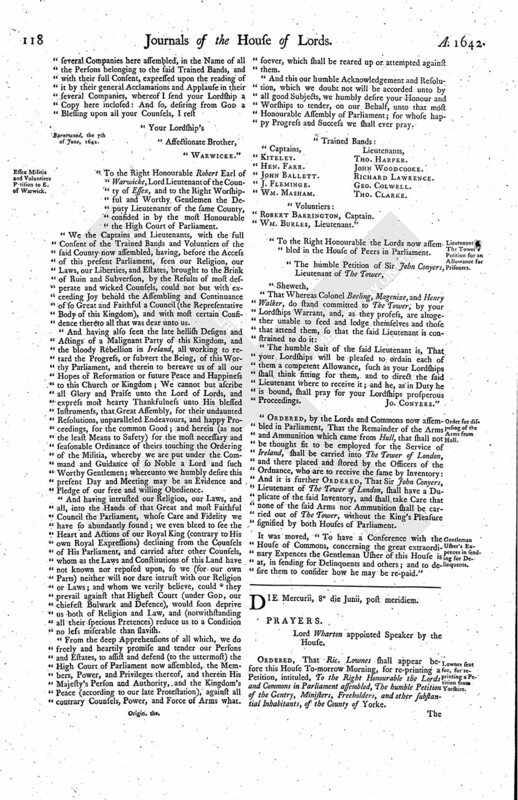 10) the Lords and Commons now assembled in Parliament, That the several Receivers of the Poll-money in London, and of the Contribution-money for Ireland, shall pay unto Mr. Loftus, Deputy Treasurer at War in Ireland, Six Hundred Sixty-two Pounds, One Shilling, and Four Pence, towards Payment of the Garrison now settled at Londonderry; Six Hundred Twenty-seven Pounds whereof is remaining in the Poll-office, and Thirtyfive Pounds One Shilling, Four Pence, remaining in the Chamber of London, being the Residue of Two Hundred Pounds given by Mr. Packer and Mr. Browne, towards the Wars for Ireland." "It is this Day Ordered, by the Lords and Commons in Parliament assembled, That Two Pieces of Battery, with their Furniture and Equipage, be forthwith sent over into the Province of Munster in Ireland, for the Defence of that Province." "It is this Day Ordered, by the Lords and Commons assembled in Parliament, That the Treasurers appointed to receive the Monies that come in upon the Act of Subscription do forthwith pay unto Mr. Loftus, Deputy Treasurer at War in Ireland, Ten Thousand Pounds, to be sent forthwith into the Province of Munster, for the Use and Relief of the Army there; and that they shall be re-paid the said Sum of Ten Thousand Pounds out of the First Monies which shall be paid in Part of the Hundred Thousand Pounds promised on Friday last to be lent by the City of London." Ordered, That the Report of this Conference shall be made To-morrow. 1. Origin. E. of Warwicke.